There is a piece on the BBC today about solitary confinement which leaves me wondering if I'm responsible for my own mental decay. For days on end I see nobody here and it makes me more than a little crazy. Visitors are few and far between, we've either been unlucky or poor hosts when inviting strangers to stay as volunteer workers and the isolation here, which I adore, is complete apart from the odd intruder looking for lost dogs or what they can find to carry off. It's not something internet socialising is much help for. When I do have company we try hard to keep the activity levels high. Last winter another large oak tree fell on the boundary of the forest and our far field. It's not always easy to see why these large healthy trees can't take the wind when their equally large neighbours not three metres away survive the gusts but in this case it was probably made top heavy by a massive overgrowth of ivy in the crown which caught the wind and rocked it on roots undermined by a deep ditch and very wet weather. It's a shame but the wood is valuable and we have to clear the trunk from the field before it's swamped with brambles and overgrowth and becomes too difficult to dispose of. This trailer load was really just the tip of the ice berg; a fallen tree is more dangerous during dismantling than a properly prepared tree taken by managed felling because odd limbs and random balance make it unstable. It's easy to cut the wrong support and have the whole thing collapse on you. So we've been nibbling away at it, cutting back to see where the weight is distributed and aiming to leave a clear bole where the fall can be predicted before making the larger cuts. After chainsawing the branches down to manageable chunks we spent a few hours splitting the logs with axes and stacking it in the wood shed. Ideally it should have two years to dry and mature before burning but the last couple of cold winters have left us very short of fuel so we've been splitting this quite small to dry as quickly as possible. There's still a lot of tree left to come. 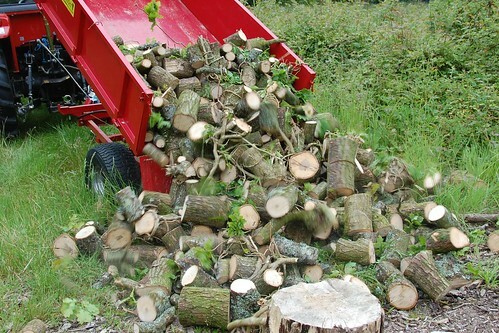 The main trunk will likely be too large for splitting by axe so we'll have to make use of the log splitter on the tractor. The old adage about firewood warming you in three ways is absolutely true. It's hard hot work gathering, splitting and stacking the stuff, and that's long before you burn it.